Operation Safe Pass – organised by the Safer Essex Roads Partnership with support from its partners, Essex Fire and Rescue Service and Essex Police – aims to replicate the good work of similar schemes across the UK, such as by West Midlands Police. The first operation took place today (6 September) in Colchester and saw one motorist educated after passing a cyclist too closely. 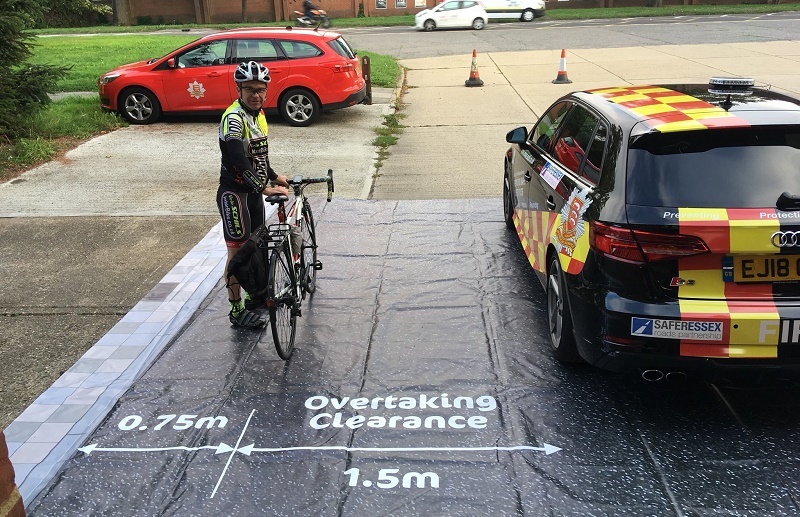 Plain-clothed ‘Bikeability’ instructors spotted motorists passing as an unsafe distance (closer than 1.5m), before officers escorted the drivers to a check-point where they were educated on how they should safely pass cyclists and horse-riders. “We have listened to the cycling community – a road-user group we wish to encourage for a variety of reasons including health benefits and sustainable transport. “Everyone has the responsibility to share the road and everyone has a part to play in keeping all road-users safe. We often forget that the majority of cyclists and horse-riders are also motorists and sometimes the lines get blurred. Ultimately, it does not matter what form of transport you use. We all have the right to feel safe on our Essex roads. “Cyclists can also improve awareness of using the road – Safer Essex Partnership offers a host of training through the Bikability scheme and I’d encourage cyclists who are lacking confidence or who wish to brush up on their knowledge, to have a look at the SERP website. “We continue to push Extra Eyes submissions too, so if anyone captures poor road-user behaviour, including close passing, please send us the footage. Last month we prosecuted 14 drivers for close pass offences. “Whilst it is encouraging that on this occasion only one motorist was found passing too closely, we know that cyclists and horse-riders experience close passing quite frequently on Essex roads. We hope these operations will help educate road-users about our joint responsibility to share the road safely and considerately. For more information on the Extra Eyes initiative, please visit www.saferessexroads.org/extraeyes.